Countering Venice Biennale’s narcissistic tone this humble show, set in a deconsecrated Italianate chapel (Dilston Grove), works on you like a transcendental Indian raag; quietly seeping into your whole being. Between Thought and Space is a live interdisciplinary site-research project spanning September 2014-December 2016, involving 12 practitioners collectively exploring the social, material and historic fabric of Dilston Grove, a Grade-II listed building set on the edge of Southwark Park. The first church on this site, a ‘spiritually destitute district’, was opened in 1886 by Clare College Cambridge as part of a university mission. The Bermondsey Artists’ Group rescued the space in 1999 and the raw nature of the cavernous space proved to be ideal for installations, performances, large-scale video projections and other experimental projects. By 2008 the building had decayed beyond repair but was refurbished in 2010. Echoing throughout this austere concrete structure is Isha Bøhling and Ian Monroe’s penetrating sound installation. Based on mathematical ratios of the church’s architecture, a sonic rising and falling away is ever-present, without being obtrusive or blocking other ‘voices’ in the show. Over time you become aware of silent pauses, which somehow re-frame the space, revealing the beauty of site imperfections alongside a determined resilience: rust-scarred walls bearing traces of past structures; window-grids, distorted – behaving as if set free in spring. 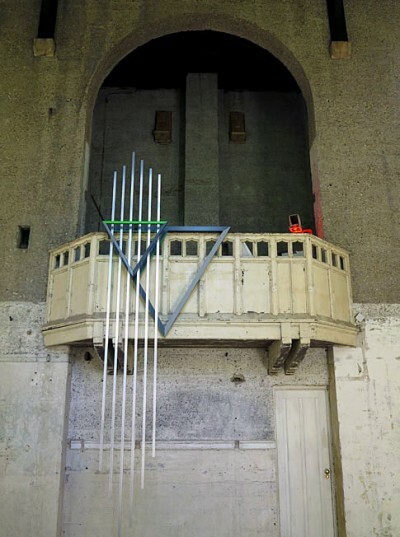 In Prime, steel angular rods of varying lengths descend from a redundant pulpit, like organ pipes in a musical scale. Positioned nearby is a fluorescent-orange baton: a live invitation to play, to connect, to be in relationship to, to personally transform the experience for self and others. This sense of call-and-response, of receptivity, of conversations to-ing and fro-ing between works, implies a democratic sensibility that’s repeatedly felt throughout the show: a testament, perhaps, to the project’s collective approach. With tenderness, you are held in the space. In bold contrast, Ian Monroe’s 63mm, a sharp-edged archeological ‘slice of office life’ bisects the central area, where the congregation might have once sat. Using fragments salvaged from Canary Wharf, this 63mm-wide transect of familiar readymades (phones, computer monitors, filing cabinets, lighting fixtures, carpet tiles) speaks with Vorticist passion of commerce, financial markets, globalisation and speed: 63 mm is the distance the shortest possible trade signal travels at the speed of light. Close-by, Shin Egashira’s discordant yet related everyday chairs sit patiently in limbo – a liminal space of inbetween-ness: connected but not quite communicating. Beyond language, spending time in this show is a poetic experience; a lived understanding of thought and space.